Thank you for your business. We very much appreciate your continued consideration of Cintrex for transfer and media conversion services. We can now capture the audio on Regular 8mm film with sound strips, and on Super 8mm film with OPTICAL sound strips. Previously, we were limited to capturing audio on Super 8mm with magnetic sound strips, and 16mm film with either optical or magnetic sound strips. We have four (4) Universal Retro film scanners in production, plus Sniper film scanners for backup. New Service Handbooks are being sent out during the months of September and October. Cut-off date for guaranteed delivery back to you before Christmas is December 7th 2018. Have your orders into us by December 7th, and we will deliver the finshed goods back to you by December 21st. After Dec 7th, we will make best effort to return the digital files or ISO images by December 24th. Film Transfer Update - We have put our new Universal film scanner into production full time, previously using it only for shrunken or warped film. The scanner has no sprockets, no claw, and no pressure plate; the scanner's motor turns the take-up reel, and the film is pulled acorss a lighted area where the individual film frames are scanned by the overhead HD camera. The camera on the Universal provides sharper definition in its 1080P HD film capture. A comparison of the output of our existing Snipers' HD film transfer versus the Universal film transfer is shown here for 8mm film, and here for 16mm film. We have ordered a 2nd Universal film scanner and will use these scanners for orders from resellers asking for high definition movie files (MOV and MP4) as the final output. Additionally, sometime in 2017, the manufacturer of the Universal film scanner plans to release a 2K camera for its scanner, and we will purchase these new cameras to provide an even better, higher quality film transfer service. Film Transfer Production Capacities - We currently have four (4) active film transfer scanners in production, and two (2) units for backup. If all 4 scanners are in operation, we have annual capacity output of 4M film feet per year. Film with Sound pricing update - we have inhouse capability for capture of optical and magnetic sound on 16mm film, and magnetic sound on Super 8mm film. Pricing for capture of sound on film is now $25 retail per 1,000 feet of film with sound. Examples of the new pricing in practice - If you send us 5,000 film feet, all with sound, the price for sound capture is $125 retail / $75 wholesale. Or, if you send us 5,000 film feet, but only 800 feet has a sound strip, the charge is $25 retail / $15 wholesale. Price Change Notice (effective October 1, 2016) for Consumer type Video Tape conversions - Pricing for this service category has changed. Transfer rates are $20 retail for conversion of video tapes to MP4 files, and $25 retail for conversion to DVD or Blu-ray Disc or other Data File types such as MOV, AVI, or ProRes 422. There are no quantity discounts for conversion to MP4 files, but we will offer an add'l 15% discount off retail rates for 20 tapes or more on all other converted outputs. When transferring tape to disc, our practice is to combine tapes' content onto as few DVDs or Blu-rays as needed. If your customer wants a separate DVD for each video tape, you need to let us know ahead of time. Depending upon the situation, a markup of $3 may apply on one-to-one transfers. Copies of the new service handbook containing pricing and training information will be sent out in the coming month. Inbound shipping of your orders into Cintrex AV will no longer be free in all circumstances. Effective September 1st, resellers that regularly use our UPS shipping label application, or ship COLLECT against our UPS account number, will be charged $10 on packages received in our warehouse that contain less than $100 in wholesale purchases. Cintrex AV will send out a letter to all resellers about this change. It is strongly recommended that you aggregate your orders into fewer boxes, so as to be less impacted by this change in policy. Again, if you ship to us on our dime, the package must contain at least $100 in aggregate wholesale purchases to avoid any shipping charges from Cintrex AV. If applicable, the $10 shipping charge will appear as a line item at the bottom of the wholesale invoice for one of the orders contained in the original inbound package. In our Custom Editing category, we are offering Highlights Video services. Wholesale pricing on our editing services is 30% off retail. So much of what people transfer is not worth saving for the long term. Professional archivists state that only 5% of recorded material is worth keeping. After your customers have digitized their videos and movie films and 35mm slides, what can you offer them so that their rediscovered memories are again there for play and sharing? Check out our Highlights Video offering. It's also a service you can offer young families that take videos everyday with their digital cameras and smart phones. Another way to help serve your customers. The Highlights Video service includes a year subscription to LightJar. Everytime your customer uses LightJar they will see your company name in the dropdown menu. Film Transfer & LightJar dual promotion - customers wanting film transfer to DVD, can receive a second format conversion to MP4 files for no charge if they order either a 25GB or 50GB annual subscription to LightJar. It is a cost savings to the customer, and increased sales revenue for the reseller. More information is here. LightJar Media Services is a new category, offering faster turnarounds and lower prices than normal wholesale rates on certain media conversion and editing service products. Examples of lower prices - video tapes to mp4 files for $9 wholesale, data files to DVD for $19.80 wholesale, and an annual subscription to LightJar's 50GB plan for $9 wholesale. The 50GB plan can store up to 25,000 photos or 30 hours of mp4 video files. The category is displayed on this website's main page, and is listed in the drop-down menu underneath Media Services. LightJar Media Services are available to the resellers that have a LightJar subscription. LightJar subscriptions are free for any reseller doing $2,500 or more annually with Cintrex. If less than $2,500, we can offer a 50% discount off a LightJar subscription rate, if you wish to use the service for your own business. LightJar, our cloud storage service, is now available for resale, with the wholesale rate being 35% off suggested retail rates. You can order LightJar subscriptions from this reseller website. Order turnaround is 1 day..
Our sprocketless 16mm film scanner is now operational and can be used for jobs from film archivists or customers with damaged or shrunken film. AT THIS TIME, we are only doing this type scanning for 16mm film. We may order an 8mm gate for this service in the future, but most likely not until the new year. We are doing more online collaboration with resellers, using our LightJar service to both receive content and then to deliver completed ISO images and/or mp4 files made from film, video tapes, or from photos and slides. When there is a quick turnaround needed, consider receiving back a soft copy of your project, and you can then customize the DVD or slideshow with additional branding. The 2015 edition of our white Service Handbook is now available. You can download a copy by accessing it under the Reseller Info nav heading. If you want a new hard copy of the book, let us know, and we'll send you a copy via US mail. Increase the revenue value of your individual sales, and offer something that makes a onetime customer a repeat customer. Our cloud storage service, Lightjar, is now available for your use in your own business or for resale to customers. You can purchase a subscription for your customers from our storefront, and you can also join our affiliate program for passive sales resulting in 15% commission. The affiliate program is explained here. We pay you commissions of 15% for your customers that sign up for the service, for as long as they continue to use the service, and we give them an upgrade in storage capacity if they use your affiliate referral URL along with a promo code received from you - a win/win/win for all involved. 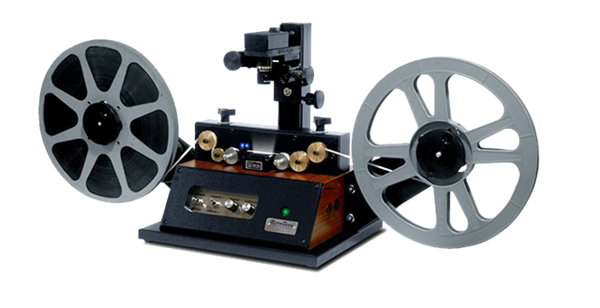 In early August, we will be receiving a new 16mm film scanner, the same model film scanner used by the Motion Picture Academy for scanning its valuabe film archives to produce access copies for interested parties. This newly manufactured scanner will give us the ability to scan 16mm film without touching the film's perforations, and will instead use an optical pin guidance system to advance the film and record/scan its contents to produce high definition digital file copies of the original film media. We moved our physical office at the beginning of June 2015. Our new address is 101 Weldon Parkway, Maryland Heights, MO 63043. Our telephone numbers are 800-325-9541, or 314-942-1110 (new local number) and 636-343-0178 (our previous number, call forwarded to our new site). Our new cloud storage service is in Alpha testing. It's a web application called LightJar, providing an online private, secure storage service for your media collections of videos, photos, and audio recordings. Subscribers are able to add items, organize them, edit item descriptions, and share their collections with others, doing so from any device with a modern browser and access to the Internet. Our target audiences are families, busy moms, family historians, and small businesses, all wanting an easy means to save their media recordings, and view, update or share them from any device, anytime. A sweetspot for LightJar - the smaller subscription plans offer more storage than the free services, but are cheaper than the major providers. We also designed LightJar to handle large long video files. LightJar can accommodate your videos and images that we have digitized in the past, or store the new videos and photos that you take today with smartphones and cameras. In the future, we plan to promote LightJar to our reseller network as a business tool for their own use and as a subscription service for resale to customers. If interested in testing the service, please visit LightJar and sign up only for the monthly 10GB plan, and cancel before the end of 30 days. The first 30 days are a trial period, giving the subscriber a chance to test the service before the credit card is charged at the end of 30 days. If you want to sign-in with your Google login credentials you can do that too, by choosing the Sign-in option (not Sign-up). Happy New Year. We are consolidating the Cintrex online order entry points from two down to one. The online storefront at https://shop.cintrexav.com will serve as the order entry for all Cintrex AV customers, both retail and wholesale. This changeover will happen at the end of January 2015. Login to the storefront will use the same email id on file for our resellers, and initally all persons logging in for the first time will have the password "reseller". Once logged in with the temporary password, you are welcome to continue to use the "reseller" password, or change it to one of your choosing. Only to need to log in once, rather than twice, because of systems' consolidation. Terms of Service available for review. Additional calculators for film footage, retail pricing, and file sizing. Cutoff date is December 15th. Orders into us by Monday December 15th will be returned by Dec 24th. We offer for purchase various sized USB Flash-drives (16GB / 32GB / 64GB) and external hard-drives (500GB / 1TB / 2TB) for storage of your customers' new data files that come from conversion of film, videos and slides. Our practice going forward will be to format these storage media in exFAT (extended file allocation table), a format readable by both Windows and Apple operating systems. If you want something other than exFAT formatted storage media, please let us know on your order forms. Thank you. (updated July 2015) For your customers wanting to transfer 35mm film to DVD, Blu-ray Disc, or Data File Format, we can act as the one-stop shop and outsource film scanning to CinePost (Atlanta Ga). Pricing follows with suggested retail (wholesale) prices: Minimum Job (300ft or less) is $200 retail ($150 wholesale); for footage amounts more than 300ft, please add a rate of $0.33 per film foot ($.25 wholesale) on top of the minimum $200 retail ($150 wholesale) pricing. These rates are guidelines only. A final estimate will be provided before transfer, and we can return the film at no charge if something is a surprise to you or us. We can edit and reformat the 35mm content into DVD, Blu-ray Disc, or other file formats. We added new products for Film Transfer, Video Tape Transfer, and Digital-2-Digital Transfers. The new transfer products result in digital file formats, competitively priced and appropriate for today's modern customer. High Definition Film Transfer of 8mm and 16mm film to HD MP4 files, delivered back to the reseller via Web download, priced retail @ $0.15 / film foot, (standard wholesale pricing starts at 9 cents per foot). Home Movie DVDs converted to mp4 files, priced at $16.50 per DVD - gives families a way to better preserve and share their previously recorded videos. If you order online via the NowCommerce Order Portal, we have 2-4-1 Specials on High Definition Film Transfer services. Item # FT-09 for 8mm film, and item # FT-10 for 16mm film have a retail transfer price of $0.22 per film foot (wholesale $0.132/ft. ); and you receive back any two (2) new formats available from Cintrex AV. Choose from options such as Blu-ray Disc, DVD, HD-MOV, HD-AVI, HD-MP4, or Apple ProRes 4444, or other formats such as JPG or TIFF files. Make sure to tell us in the comments field which 2 new formats you want for your customer. The latest computer laptops, pads, and tablets do not have disc drives to play video DVDs. The latest Blu-ray players do more than just play DVDs and Blu-ray Discs. They serve as gateways and media players for video content coming from streaming providers such as Netflix or YouTube; from the viewers’ own wireless connected laptops; and from attached USB flash-drives. Consumers regularly record in HD Video and play their content on HDTV. The standard definition DVD DISC is not dead yet, but today’s video viewing experience is much better served by digitized video and image content that can be easily transported, shared, and stored in multiple places. Access by the subscriber to professional services for formatting their cloud media content. Media Conversion to Data Files - Besides DVD and Blu-ray Disc, we offer conversion of film, video, and other media to Data Files, such as MP4, MOV, and AVI files types. We can deliver these files via WEB download or via data disc, USB Flash-drive, or external hard-drive. Resellers and their customers can supply their own flash-drives or hard-drives, or purchase them from Cintrex. Starting Feb 1st, we are lowering the purchase prices of storage media and they will no longer be eligible for wholesale pricing. Prices are as follows: 500GB hard-drive $75. 1TB hard-drive $100. 2TB hard-drive $150. 16GB flash-drive $20. 32GB flash-drive $35. Free Blu-ray Player on Qualifying Orders - If your customer orders a film transfer job of 5,000 feet or more, they qualify for a free Blu-ray Player. Write the Coupon Code BLU-RAY on your order submittal. WEB Content - copy and paste HTML code for advertising media conversion services on your own website is now available. To find out more, please click here. DECEMBER 9th - Holiday Season Cutoff Date for Guaranteed Delivery back to your Before Christmas. Orders must be in to us by December 9th 2013 for us to promise delivery back to you before Christmas. ON-LINE CLOUD STORAGE now available for film transfer orders from our resellers. We will provide one (1) year complimentary cloud storage for film to DVD, film to Blu-ray Disc, and film to data file formats. More information can be found on this page within the reseller website. Log-off - The log-off link is at the bottom of any page in the reseller's website. Adobe Premiere Pro CS6 Certification - Cintrex AV video editor Ken Marcum achieved Adobe certification on Adobe Premiere Pro and Encore editing tools on July 17th. A sample of some of his work is listed in the next news item. Disc Menu Template Options - we have more menu templates from which to choose from; click here to see sample menus. Let us know which menus you prefer to use for your customers. Thank you. Four (4) items - video tape transfer pricing, Online Retail Price Quote Generator, a new 2013 Service Handbook, and availability of online downloads for faster delivery of customer orders. Pricing for video tape transfers for resellers is being shifted to the new pricing, introduced first of the year on a trial basis. Per Tape Pricing: Video tape transfers to DVD, Blu-ray Disc, or data file formats is $25 per tape. Quantity discounts are available: 10 or more tapes - 15% additional discount off wholesale rates; 25 or more tapes - 25% additional discount off wholesale rates. Combining Tapes: The new pricing is effective for all video tapes, whether each tape gets it own DVD, or tapes are combined onto few disc as possible. Per Content Hour Pricing: For competitive bid situations, for a customer with lots of video tapes, each with little content, we are offering retail pricing of $16.50 per content hour, minimum order is 2 content hours. Wholesale pricing is 40% less. No other discounts apply, and this option is not available for a customer wanting a separate disc for each tape. We are phasing out the previous pricing model for combining tapes onto DVD - we no longer will offer first tape at $33 retail price, and each add’l tape on the same DVD at $10 retail. Retail Quote Generator - We have a new Retail Price Estimator tool. It is based upon our suggested retail pricing. Online Order Delivery: We have started delivering completed orders via Dropbox and our own cloud storage option for resellers wanting a faster turnaround on completed customer projects. Call us for details. Look for more information on this service in the August - September timeframe. New 2013 Service Handbooks are now available. Call or email us for your copy; or you are welcome to download a soft copy for your review. Film Scanners and Custom Disc Menus - We have six (6) HD film scanners, 2 for 16mm film (w/ sound), and 4 for 8mm film (w/ sound). Annual production or transfer capacity is 2.3M feet of 16mm film and 4.6M feet of 8mm film. All scanners provide a 1080p output in avi file or jpeg film formats, which we can reformat for MOV or MP4 files on storage media, or as video optical discs (Blu-ray, DVD, and M-DISC). We can help you during seasonal or peak demands, so that you can gain every bit of your customers’ business. We’ll customize chapter menus as desired. Another example of our latest addition in sample disc menus for video and film transfers is on display here. Kodak Picture Discs - we have a local St. Louis regional source for scanning picture discs and producing digital images of the small negatives and small photos within the discs. Pricing is $5 per image. BTW, Cintrex has six (6) new HD Film Scanners. Changing Technology and Major Opportunity - Optical disc technology may be heading into the sunset in the same way floppy discs once did. The new Apple iMac has no disc drive reader. Neither do iPads. More in this CNN article about the last days of the optical disc. Sony has announced that it will no longer manufacture disc drives. Sony has also already stated that the Blu-ray Disc is the last improvement to be made on optical disc. These announcements communicate a major change in how we will need to deliver our media conversion and transfer services. Start telling your customers that you can deliver transfer of their film and video tapes onto USB Flash Drive. Start offering DVD to Flash Drive conversion. We already offer these services. The pricing and description for these services are in the price lists on this website and in the order entry portal. Customers that once had everything put onto DVD will need to convert/transfer their DVD content into .mp4 files. We can provide that service for you. Cintrex AV is implementing competitve pricing for retailers reselling our video tape transfer services. This is being phased in in the coming months; and in early 2013 we will offer 4 ways to price out this service for your customers. Method #1: Pricing of $33 retail per tape for 1:1 transfers of each tape to its own DVD or data file, quantity discounts apply (>10 15% discount, >25 25% discount). Part number is “V1-Tape-2-DVD” in the online order price sheet and order form. Method #2: Pricing for combining tapes onto few discs as possible is $33 per tape for the first tape placed on DVD or Blu-ray Disc, and each additional tape’s content transferred to the same disc is only $10 retail. For example - 3 tapes transferred to one disc has a retail price of $53. The part number for the additional tape on same disc is “V3-Add’l”. Quantity Discounts DO NOT APPLY to this part number. Methods 1 & 2 have been offered by Cintrex for the past 5+ years. These will be phased out during 2013. Method #3: Pricing per video content hour - $16.50 per content hour, billed in two hour increments. Tapes are combined onto as few video discs as possible. Applicable for transfers to DVDs and Blu-ray Discs (not data files). This pricing is ideal for customers having lots of tapes, but with little recording time on each tape. Part number is “V6-Content Hour”. Quantity Discounts DO NOT APPLY. Method #4: (new) Pricing per video tape - $25 per tape, whether 1:1 transfers or combining tapes onto few discs as possible, or for converting video tapes into data files. Pricing is applicable for transfers to DVD, Blu-ray Disc and USB Flash Drive (.mp4 file formats). Quantity discounts apply, same as in Method #1. Part number is “V8-ConTape”. DVDs hold 2 hours, Blu-ray Discs hold 9 hours standard video content, and Flash Drives can contain from 16 hours up to 64 hours of video content. DVDs and Blu-ray Discs are included in the V8 price. USB Flash Drives are available for extra cost from Cintrex, or the reseller or customer can supply their own USB Flash Drives. We have both Blu-ray Disc and USB Flash Drive duplicators for those orders wanting multiple copies. Using either Blu-ray Disc or USB Flash Drive is a great way for customers to save on physical space. Make sure to ask your customers if they want a 2nd backup copy for storage in their bank’s safe deposit box. Standard Definition Film Transfer Price Increase effective October 1st - becoming $0.17 per film foot, an increase of 2 cents per foot over current rates. Wholesale rates are 40% off this new retail price. The new standard definition film transfer service is a high quality product, better than our previous service product, due to use of next generation film scanning technology with better consistency in terms of color, lighting, and content. Quick note about our film scanning process that produces a data file or DVD optical disc for your customer. The customer’s film stock is cleaned, repaired, digitally scanned and content captured, with a picture taken of each film frame, and initial output is a standard definition .avi data file with resolution of 720x480i. With our Adobe and Apple editing systems, we then edit the content to add optional background music, onscreen titles, color correction, and other customer specified requests before making a DVD or final data file output. After shipment of the final product to the reseller, we save the order’s content in our storage network for 90 days in case of loss, edits, or need for extra copies. High Definition Film Transfer price remains constant at $0.22 per film foot. However, effective October 1st, we will no longer offer the DVD Backup copy at no charge. We will charge $15 (retail price) per content hour for extra copies in different formats. With the new film scanners, the final product has a resolution of 1920x1080p, great for showing on HDTV or HD monitors. WEB CONTENT About Media Conversion Services available for your website, either to link to tailored landing pages with your logo (maintained by Cintrex) or to have and amend for use as content on your own website. Please visit this page http://cintrexav.com/resellertemplate/Home to browse through the sample pages available for your use. Again, we will tailor the pages to match your logo, your pricing, and your unique messages to your customers. We can also tag the pages to help with web searches for these type services. ONLINE CONTENT STORAGE, SHARING, AND VIDEO EDITING - we plan to introduce Phase 1 of our VSSP (Video Storage and Services Portal) in mid 2013. It is planned to offer our resellers the availability to download their transfer orders via the Internet in addition to receiving a disc or hard-drive. If desired, they will also be able to store their video and image content online, add to it, edit it online, download, upload, and share their content with their own customers. Access and storage will be secure, and content will be backed up in multiple places. We plan to make available work space in the storage cloud for our resellers, the purpose being to help resellers market their products and services to their customers. Upgrade to Standard Definition Film Transfer - better quality than our previous transfer system because each film frame is scanned, a picture taken of each film frame, rather than us capturing an aerial moving projected image as we did previously. The resultant product is more consistent in terms of light and playback speed, there is very little flicker, and 100% of film content from the top to the bottom of the film frame is presented. Our high definition (HD) film transfer offers two (2) advantages over a standard definition (SD) film transfer product: Better picture quality - almost 4x the information is captured and presented in HD’s 1920x1080p format as compared to SD’s 720x480 format, resulting in better color and clarity when shown on HDTV via Blu-ray Disc, or via media player reading a H.264 high definition movie file (.mov, .avi, or .mp4). More content- the HD film scanner captures all film content outside the standard 4x3 aspect ratio associated with SD film transfer. The HD product can show the entire film frame’s contents; presenting a more complete transfer of what was originally recorded. If the final output is a Blu-ray Disc, we can apply a mask (crop) that presents a larger viewing area than SD’s 4x3 but does not show the film frame’s less developed edges or film perforations. If requested by the customer, the final output can be a high definition data file for later editing, retaining all content from the film frame, showing everything as originally recorded (including the film’s perforations). See the example below of a Super 8mm film frame captured by the HD film scanner. Everything outside the yellow standard definition (4x3 aspect) box can be included in our HD data file formats. More Options for the customer: The captured film content is encoded into low compression intermediate data files for subsequent editing and reformatting into your specific requested product output. Examples of final product output are the following: 1) HD movies on Blu-ray Disc; 2) high definition movie files (H264.mov, .avi or .mp4) placed on data disc or external hard-drive; 3) numbered image sequence files (one jpg or .tiff file for each film frame) placed on external hard-drive; 4) standard definition movies on DVD; and 5) lower resolution, highly compressed data file formats (.mp4 and .wmv) for delivery via the Internet. Suggested Pricing Guide - for audio reel-to-reel conversions, we suggest two (2) pricing options, charging the higher price of the two options. Our practice is to charge the more expensive price, whether based upon actual minutes of content, or based upon the minimum order value for multiple audio reels. Unlike film and video tapes, which are quickly determined to have content, each audio reel must be played in its entirety to discern the presence of audio content. If there is little content, a minimum order amount is charged. If there is significant content, sometimes across 4 tracks on one audio tape, then additional work is done to properly format and transfer the content to CD. Option B is a minimum price per audio reel, often applied to customer orders with a large number of audio reels, but few minutes of audio content. Effective mid July 2012, we began charging a minimum retail rate of $45 per audio reel, with the corresponding minimum wholesale rate being $27 per reel. Quantity discounts will apply for orders having multiple number of reels, but very few minutes of content. > 10 audio reels yields add’l discount of 15%; and > 25 audio reels provides add’l discount of 25% off both retail and wholesale prices. As an example: A customer brings in qty. 10 3-inch audio reels for transfer to CD. The possible retail value for this type order could range from $0 to $800, the final dollar value dependent upon how many minutes of audio content can be transferred from the tapes to CD. The minimum order value, based upon number of audio reels is $450. For special bids or competitive situations, please call Cintrex AV on 800-325-9541. Two (2) new posters for store owners to advertise their conversion services. Please view the new marketing materials under the support navigation tab. These posters are orderable today. New Film Transfer Platform (updated August 3, 2012) - we installed new high definition 8mm film scanners (Qty 3) in July. We are still waiting for our new 16mm film scanner which should be installed and running sometime in August. The film scans will be done in 1920 x 1080p HD, and final product transfer will be available in Blu-ray Disc and HD data files (.avi, .mov, and .mp4). Total annual transfer capacity will be approximately 5 million film feet, double our current production capacities. UPS Labels: Please use our online UPS label maker software app located within this website at http://partners.cintrexav.com/index/ups-label-creation.htm. Creating the labels within this UPS application provides better protection against lost shipments and saves money. Shipping is still free for resellers, but it saves Cintrex money. This helps keep our prices competitive. Thank you. New website rollout for partners at Partners.Cintrexav.com. The website provides access to product information, online order entry, order status updates, marketing support programs, training and marketing materials. We appreciate in advance your feedback and suggestions to improve this website for your use. Film Transfer - July 1st new retail rate of 16 cents per foot, or $8 per 50 feet, for standard definition transfer; and 22 cents per foot, or $11 per 50 feet, for high definition transfer. Video Tape Transfer - Quantity discounts are now available: 15% off retail and wholesale rates on tape quantities > 10, and 25% off on tape quantities > 25, applicable to tapes transferred each to its own disc or data file format. Video Tape Transfer - optional flat rate pricing available, based upon hours of content, offered at $16.50 (retail) per hour of content, may be presented to customers that are unsure of how much content they have on their video tapes, and want a better deal. Video & Film - continuing to offer digital data file formats as alternative to DVD or Blu-ray Disc. Video & Film - offering option of second copy, but in different formats, such as Data File along with DVD, or Data File with a Blu-ray Disc; with a separate reduced charge for the second format. Slides, Photos and Negatives - now have separate pricing components for digitization of images and putting digital images into video slideshow. We did this at the request of resellers that wanted digital images only. Digital Archival options: Archival M-DISC as backup video DVD is $20, or as a data DVD for $30; options to save content on Dual Layer Blu-ray Discs and LTO tapes. If you do not already have an assigned password for our Order Entry portal on the homepage, please let us know and we’ll get one to you. The Order Entry portal is for placing orders, checking order status, checking your account’s business transaction history with Cintrex AV. UPS Label generation - effective as soon as possible, please begin using this website to create your UPS labels to attach to your packages that you want to ship for free into Cintrex. After placing the label on the package, give the package to your UPS driver or take the package to the nearest UPS store or dropbox. Put the packages inside the dropbox, please do not leave packages unattended, out in the open. Cintrex will no longer request UPS call-tag labels or mail out UPS pre-made labels. We are asking all partners to create labels electronically because UPS charges Cintrex $5.43 for each pre-made label used on packages, over and above actually shipping costs. This practice of charging us $5.43 for each pre-made label started in January 2010, and it was not UPS that brought it to our attention, but by FEDEX in September, who is trying to gain our business. The extra cost is charged because someone in UPS has to manually enter the weight and scan the label for ship-to information. Our web application takes care of all this electronically and we therefore avoid the charges. Shipping into Cintrex and back to the retailer/reseller will still be no charge, but it will cost Cintrex less. If you are interested in advertising Media Conversion services on your website, we can provide content for your website, or provide links from your website to a page on our website with your logo and service descriptions. Please call us on 800-325-9541 for more information. High Definition Film Transfer (great for HDTV). Blu-ray Disc service options for video tapes, film, and slides/photos; we can place up to 9.5 hours of video tape content on one Blu-ray Disc. Expanded custom video offerings to improve the customer experience and satisfaction with our media conversion and transfer services. Please check out our Memory Notes service product. Besides DVD and Blu-ray Disc, we offer all transfers as data files returned to customer on data DVDs, external hard-drives, or via Internet download. Non-logo’d order forms and packing lists – please let us know if you need additional supplies, including marketing brochures, order forms, posters, and counter-top stickers. To receive free return shipping, minimum order requirements need to be met, which is a $30 wholesale price. Most times, Cintrex will combined orders before returning a shipment back to the reseller so as to exceed the $30 threshold for free shipping.